Rowers loosen up prior to competing in the Shamrock Row. 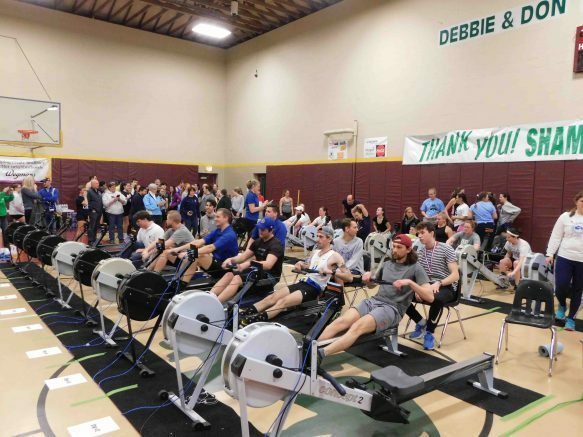 The annual Shamrock Row, hosted by the Buffalo Scholastic Rowing Association (BSRA), continues to grow every year, drawing nearly 200 participants and a gymnasium packed with cheering spectators to the Old First Ward Community Center in Buffalo on March 10. This has become an annual event, held each year the weekend between the Shamrock Run and St. Patrick’s Day weekend. Teams from Buffalo, Rochester, Erie and Ontario took part in the event, including the BSRA Junior Team; Buffalo Seminary; Canisius High School; Buffalo River Rowing Club Master’s Team; West Side Rowing Club; WeCanRow Buffalo; CrossFit Williamsville; Geneseo Crew Club, SUNY Geneseo; Long Beach Rowing Association, California; Mercryhurst Preparatory School; Our Lady of Mercy High School; RIT Crew Alumni; University at Buffalo Crew Club and several unaffiliated teams. Rowers ranged from 14 to 80 years of age! • Junior Men’s Lightweight: Canisius High School rower Aiden Hart-Nova placed first with a time of 7:14.4. • Junior Women’s Lightweight: BSRA rower Erin Jackson from St. Mary’s High School placed first with a time of 8:18.8. • Junior Men’s Novice: Canisius High School freshman John Barry placed first with a time of 7:25.6. • Junior Women’s Novice: Our Lady of Mercy High School in Rochester rower Olivia Momont placed first with a time of 8:51.8. BSRA rowers Kayla Sterner and Sydney Gunner placed sixth and ninth place, respectively. • Junior Men: Canisius High School junior James Eagan placed first with an impressive time of 6:48.7, rowing at 24 strokes per minute. BSRA’s Lucas Watson placed fourth with a time of 7:31.3. • Junior Women: BSRA rower Christina Spira from Nardin Academy placed first with a winning time of 7:39.5. BSRA rowers Chloe Freedenberg, Destiny Severn and Ava Giangrasso placed fourth, fifth and eleventh, respectively. Buffalo Seminary rowers Anya Casey, Sophie Bates, Katie Pohlman and Eva Maines placed seventh, twentieth, twenty-fourth and twenty-ninth, respectively. • Men’s Open: SUNY Geneseo rower Colin Wilcox placed first with a winning time of 6:20.4. • Men’s Lightweight: UB rower Eric Szafranski placed first with a time of 6:50.9. • Women’s Open: UB rower Danielle Kwong placed first with a time of 7:34.3. • Men’s Coxswain Dash: Canisius High School coxswain Samuel Sullivan took first place with a time of 1:44.2. • Women’s Coxswain Dash: BSRA coxswain Seanna Zona placed first with a time of 1:59.1. Buffalo Seminary’s Annabelle Daley placed fourth while teammate Molly Schultz came in fifth. • Men’s Masters: Frank Nowakowski, unaffiliated, won the event with an age-adjusted time of 2:50.22. Will Greene, competing for SUNY Geneseo, placed second with an age-adjusted time of 2:54.01, while Paul McCarthy of BRRC/BSRA placed third with an age-adjusted time of 3:06.6. • Women’s Masters: Elizabeth Oster-Denecke of UB placed firstst with raw and adjusted. Her final time was 3:35.01. Christi Roorda-Ciacio of BRRC/BSRA placed second with an age-adjusted time of 3:42.42, while Hilary Epes-Oballim of BRRC/BSRA placed third with an age-adjusted time of 3:45.6. • Men’s Masters – Novice: John Walker, unaffiliated, placed first with an age-adjusted time of 3:10.6. Brian McGhee of CrossFit Williamsville placed second with an age-adjusted time of 3:23.4. • Women’s Masters – Novice: Ann Marie Gannon of BSRA/BRRC placed first with an age-adjusted time of 3:46.5. Nikki Tolias of CrossFit Williamsville placed second with an age-adjusted time of 3:50.7. The Buffalo Scholastic Rowing Association is a nonprofit organization located at 405 Ohio St., Buffalo, providing access to the Buffalo River. For more information on the BSRA, membership or upcoming programs, please call 800-5460, visit https://rowbuffalo.com or email info@rowbuffalo.com. You can also follow the organization on Facebook at www.facebook.com/RowBuffalo for frequent updates. Be the first to comment on "Buffalo Scholastic Rowing Association hosts successful Shamrock Row"